The slow cooker has a LOW setting and a HIGH setting. Recipe times are given for either cooking on the LOW setting or the HIGH setting. HIGH time is generally double that of LOW time. It may happen that the time available for cooking is longer than the time to cook all at the HIGH time but shorter than the time to cook all at the LOW time. Since a purpose of the slow cooker is to benefit from the enhancement due to slow cooking, maximum slow cooking time should be used. One scenario is when a person is at home during the entire time available for cooking. Then the slow cooker can be started on the LOW setting for a specified time and switched to the HIGH setting for the remaining time. The sum of the LOW and HIGH times will equal the time available for cooking. Another scenario would be when one is away from home for part of the day. In the case that the LOW cook time exceeds the time away, the procedure would be to use the cooker on the LOW setting and then switch to the HIGH setting for the time remaining on the return home. 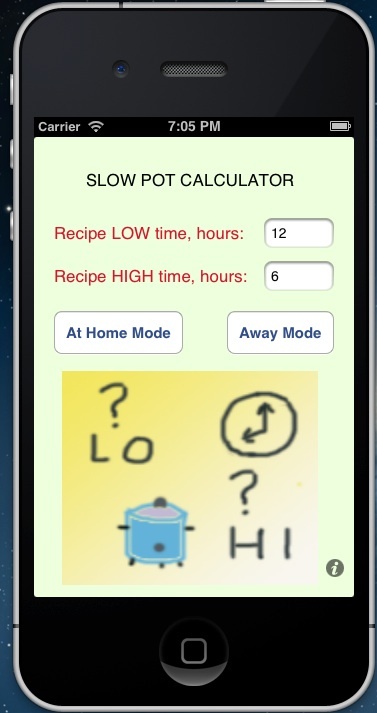 The calculator may be used to run a scenario in the AT HOME MODE or to determine, in the AWAY MODE, the time remaining to finish cooking on the HIGH setting after an elapsed period of cooking on the LOW setting. As an example in the AT HOME MODE, assume the LOW cook time is 12 hours, the HIGH cook time is 6 hours, and the available time for cooking is 7.5 hours. The calculated times are a LOW setting of 3 hours, and a HIGH setting of 4.5 hours. As an example in the AWAY MODE, the cooker is turned on with the LOW setting upon leaving home. On arrival home,the actual time the cooker has been operating on LOW is entered in the "Cooked on LOW setting". The calculator gives the "HIGH setting to finish time" and the cooker is switched to HIGH setting for that time. For a "Cooked on LOW settng" time of 4.5 hours the calculator gives 3.75 hours for "HIGH setting to finish time". The info screen has the same content as shown here for easy reference. Slow Crock is a companion app for the iPad.